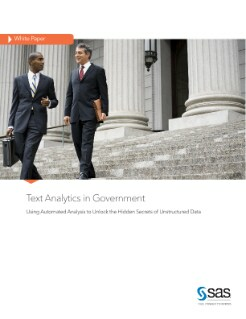 How can federal, state and local government agencies capture, manage, and use the massive volumes of unstructured text data available to them? Chances are, your agency has a lot of it; the collection and interpretation of unstructured text data is essential to many government processes and problem-solving activities. This paper explores how agencies can invest in technologies such as text analysis to help them unlock insights hidden in their "big data." See how you can use it to accurately gauge public sentiment, identify unmet needs, influence opinion, shape policy, identify hidden risks, stop fraud and collusive crime, and more.